Teens are the future leaders of our families, our communities and the world. Teen Leadership is a dynamic motivational and leadership workshop for teens between the ages of 13 and 17 who have a sincere commitment to create extraordinary results in their lives. Teenagers are empowered to invent new possibilities, have the courage to face challenges and be free to create, grow, and be fully self-expressive. Our Teen Leadership program provides insights and tools for teenagers to enhance their self-esteem, improve their ability to communicate clearly, and to think critically about their problems in the context of the larger picture of life. 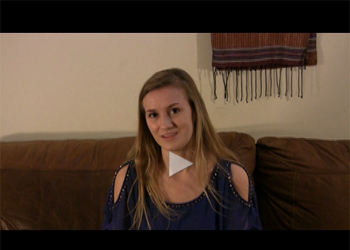 Teenagers have an opportunity to discover and redesign the limiting beliefs they have about themselves and others. These self-imposed limitations keep them from fully achieving their maximum capabilities. By teaching “Emotional Intelligence,” young adults can increase self-awareness, self-control, listening skills, and empathy, which can lead to a happier and healthier life. Teen Leadership focuses on developing teens as the future leaders of our communities, businesses and the world. Choices – what are my choices, where do I choose from, and do my choices match up with my heartfelt goals and commitments? The Teen Leadership Program uses coaching, role-play exercises, experiential games, large group and partner discussion, and reflective writing as tools to increase self-worth and empowerment. 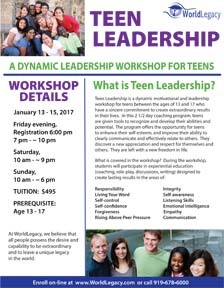 Teen Leadership is a 2 1/2 day training; periodically, we offer the training with an additional day for parents and teens to work together.